Seen here is a complete view of the printed pattern. Shown is is a matching 6.25 inch hot water jug with tilting metal lid. 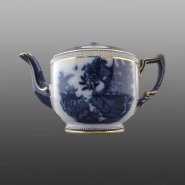 An earthenware six-cup teapot printed in flow blue with the Worcester Willow pattern with gild trim. 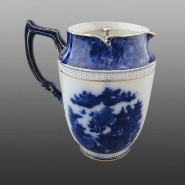 This Stoke-on-Trent, Staffordshire, firm used the trade name "Carlton Ware" to market this type of ware. The body is round shaped and has a molded, banded small circular design near the rim and base. The printed registration number 332264 was issued in 1899.